My latest find is the medal shown above was created for the 1906 annual convention of the Benevolent Protective Order of the Elks (B.P.O.E) fraternal organization. The collector actually had 2 of these very rare medals and I purchased both. The La Crosse, Wisconsin delegates of the B.P.O.E chose to feature the game of lacrosse on their convention badges because their native city was named after a sporting contest that used sticks and a ball the nearby native inhabitants were playing. According to the La Crosse, Wisconsin history records, the city’s name was derived from “…the game with sticks that resembled a bishop’s crocier, or la crosse, in French, which was played by Native Americans in the vicinity.” The sport created by Native Americans we all now know as, Lacrosse. This is truly one of the most unique and obscure vintage lacrosse medal I have found to date, which features a very big and beautiful elks head pin above the lacrosse motif badge. The scene of men playing lacrosse is interesting in that the sticks are relevant to the origins of the game and the figures appear to be Native Americans, or so I am guessing with their bare chests, long leather stitched pants, and braided hair. The medal was produced by the Scwaab Stamp & Seal Co. of Milwaukee, Wisconsin. The company was founded in 1881 and still exists in Milwaukee making rubber stamp and embossing tools. 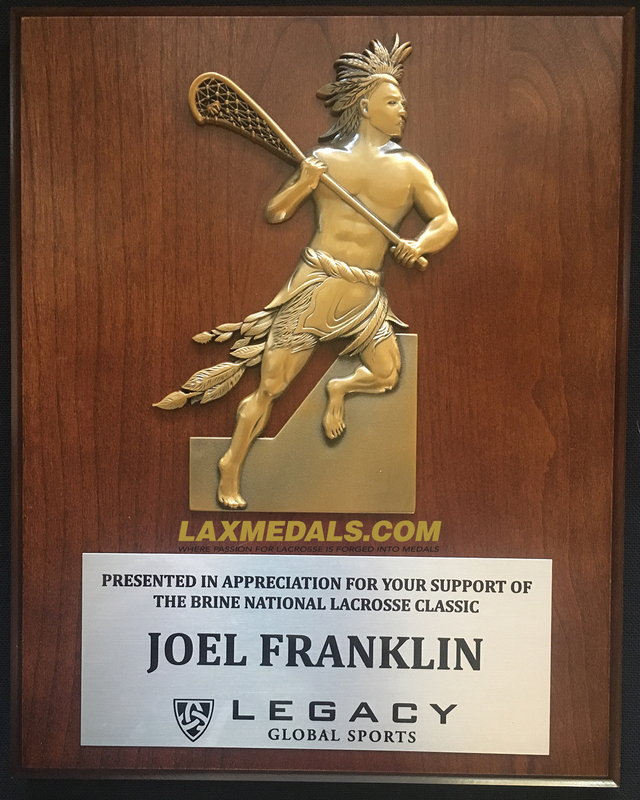 My passion for lacrosse medals not only rests in the medals I design for the current game of lacrosse…I seek out and collect vintage lacrosse medals. On the occasion of our last conversation in the summer of 2002, Douglass said he was sending me some things he didn’t know what else to with. I received a package a couple weeks later from his wife, Essie, sadly along with a letter informing me Douglas had passed away a week prior. But, following through on his wishes she sent me the box he had prepared to send me. To my disbelief, inside the box I found several vintage medals featuring the game of Lacrosse. I was truly touched to have been the recipient of something so personal belonging to someone I admired so much. Thinking back, we had chatted briefly about my lacrosse playing days at Rutgers during our interviews for the book and I guess he figured I would appreciate his medals. I surely did appreciate the medals and still have them in a frame over my desk. My collection has grown to about dozen vintage medals dating from the late 19th Century to the 1950′s. I really enjoy researching the history behind each medal and there is always something to learn about the history of the game. I often wonder what reaction players of old would have to see the modern game…to see the result of their passions in keeping the game alive through the years. And before I began this collection I never would have ever imagined they even made lacrosse medals back in the 1890′s! Douglas stone and his lacrosse medals are my inspiration for collecting vintage lacrosse medals and are the genesis for the creation of Laxmedals.com. I thought I would have appreciated receiving award medals like his during my playing days, and I was sure others would too. Since my creation of Laxmedals.com, I have been proven right a thousand times over from all the smiles I see on the faces of the kids and grown adults receiving my medals. I am proud to have met and known Douglas Stone and to share a part of his life with you, the story of a real hero. I hope the story of his life and his lacrosse medals inspire you as they continue to inspire me.